Many people enjoy the wide open spaces in Idaho, where you might see livestock grazing in pretty pastures with tall mountains in the background. Or, you might see antelope cruising through the sagebrush, a nice buck in the trees, or a frog hiding in the pond. Rangelands are a valuable natural resource in Idaho that make up about 55 percent of the state’s landscape. These are the open spaces with miles upon miles of sagebrush and grasslands in the lower country, and open forests and mountain meadows in the high country. These landscapes provide habitat for many species of fish and wildlife, spectacular places for hiking, biking, fishing and hunting, and a sustainable food source for cattle, sheep and wildlife. In 1994, a group of cattle and sheep ranchers convinced the Idaho Legislature to create the Idaho Rangeland Resources Commission (IRRC), sensing that it was important for the public and school kids to know more about rangelands. 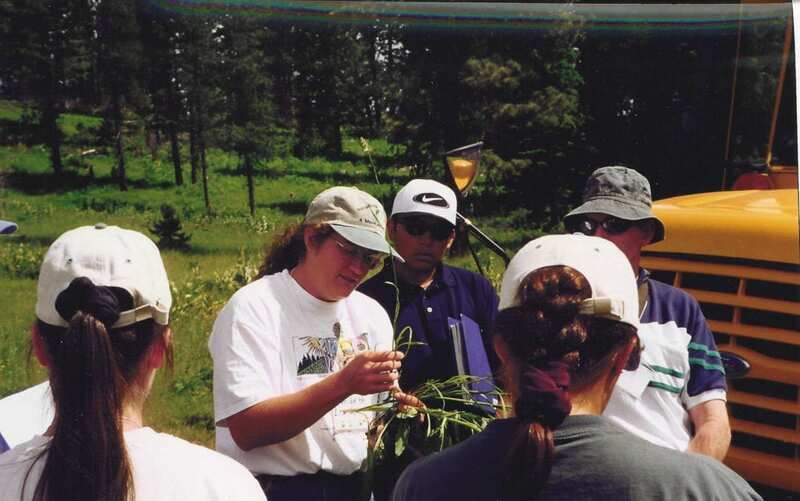 Holding teacher workshops allows scientists to share information with K-12 teachers about rangeland plants and more. By creating the Idaho Rangeland Resources Commission, the new group could work on telling the story about Idaho’s Rangelands, develop science-based educational materials for K-12 public schools, conduct public surveys, and engage in proactive public relations campaigns about ranching and rangelands. The Idaho Cattle Association and Idaho Wool Growers Association were too busy fighting political and regulatory issues at the time to engage in public relations per se. The Legislature provided a funding structure for the commission, in which cattle and sheep ranchers would pay an assessment based on the number of livestock they grazed on public lands, and a per-acre cost for private dry grazing land. Gretchen Hyde of Emmett was hired as executive director. Margaret Soulen was the first chair-person of the commission, overseeing a 5-person board of directors. Developing educational curriculum for K-12 public schools was a daunting task. Similar educational programs about forests had the benefit of a national program called “Project Learning Tree.” Wildlife education programs were called “Project Wild.” But for rangelands, Hyde had to start from scratch. 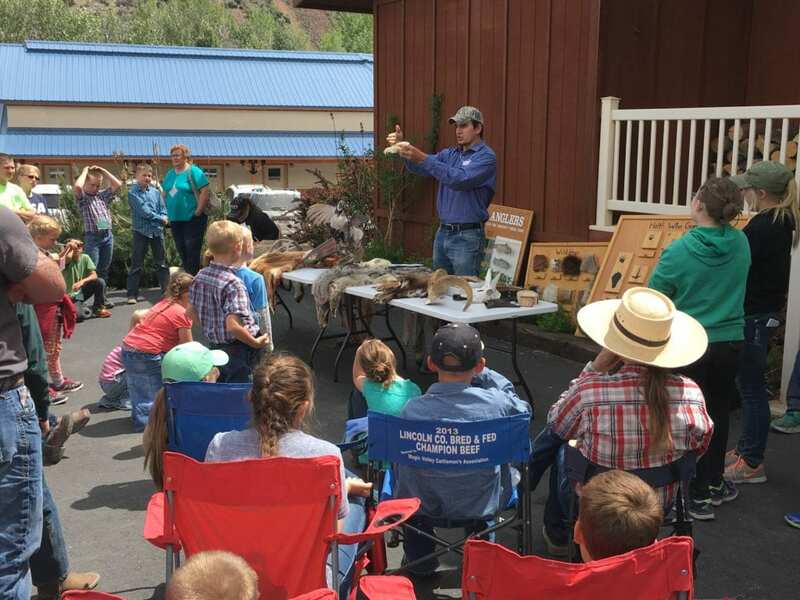 Josh Uriarte with the Governor’s Office of Species Conservation talks about sage grouse and wildlife at a Range Skillathon event. In 1997, the Rangeland Commission partnered with the Idaho Forest Products Commission to do an extensive public opinion poll about forestry and rangeland issues. About 800 people were interviewed statewide. The survey provided valuable information about public attitudes and opinions about livestock grazing on public lands for the first time in Idaho. 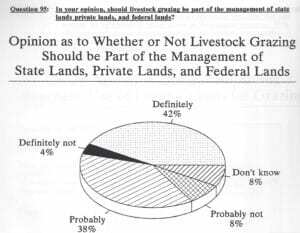 The results showed that 80 percent of the public had strong approval for livestock grazing on public lands. “With the polling that the Commission did, which demonstrated the credibility that ranchers had, more than agency people, more than environmental groups, with that in mind, they felt very comfortable about telling their story. They’re proud of what they’ve done, and rightfully so,” Brackett says. Public relations – How to reach urban audiences with effective messages? Public relations outreach started with producing short television and radio spots that were broadcast to urban audiences in Idaho’s larger cities such as Boise, Idaho Falls, Twin Falls and Coeur d’Alene. “The Commission has made a very conscious effort to talk to the public who cares about rangeland, but aren’t from a ranching background,” she says. 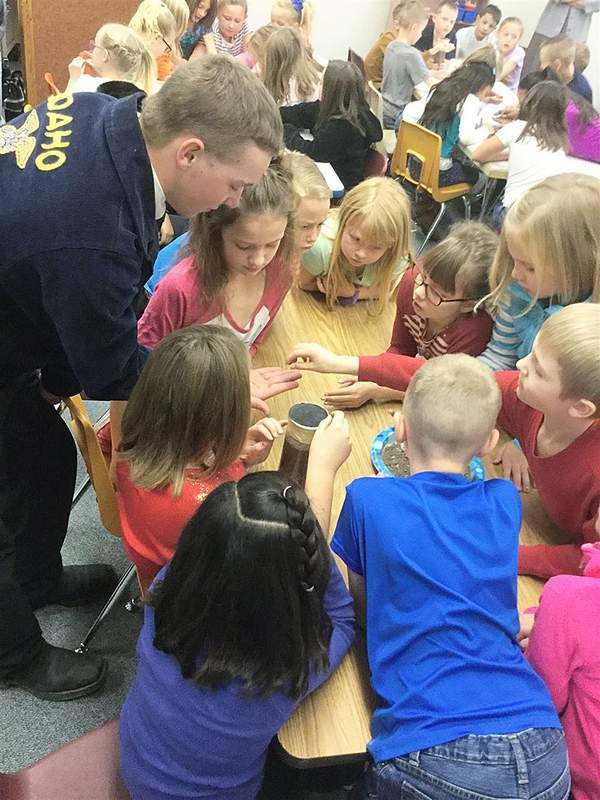 Fast forward to 2018, and the Rangeland Commission’s education and public relations outreach programs are reaching a broad spectrum of Idaho people today. For example, as new public relations tools emerged on the Internet such as YouTube, social media, Facebook and niche web sites, the Commission launched a New Media campaign in 2010 under the banner “Life on the Range.” Through a new web site, the Commission produced its own public relations videos and feature stories about ranchers working proactively to improve rangelands, enhance fish and wildlife habitat, and cope with difficult challenges such as wildfires, noxious weeds and invasive species. Times are changing on Idaho’s rangelands. Ranchers are improving the environment and sharing the land with wildlife and recreation. A new website called “Life on the Range” showcases numerous heart-warming stories about outstanding stewardship on our public lands. See how ranchers are growing organic food for local markets, creating wildlife habitat, saving endangered fish and more. Life on the Range is like sharing stories around the campfire, it’ll leave you inspired about the future. Since 2010, the Commission has produced more than 40 Life on the Range stories that have been viewed by thousands of Idaho residents and people around the world. The commission’s most popular video about sheep rancher Frank Shirts has been viewed by more than 640,000 people and counting. Many of the Life on the Range videos and stories have been picked up by the Idaho media, spreading the word to thousands of readers and TV viewers across Idaho. The videos also are shared by the Commission’s many partners on a regular basis via social media and email. “A lot of my friends on social media don’t have a clue about some of that stuff, and it’s opening eyes that were not open to those issues before,” says Rimbey. On the education side of things, the Commission provides educational materials to all of Idaho’s public schools, private schools and charter schools statewide. The Commission has distributed more than 100,000 4th grade booklets, posters, and other educational materials to the schools. The Commission contributes educational materials to all the Ag Expos hosted by FFA chapters throughout Idaho, it hosts a Range Skillathon competitive education event each year for students, and it partners with the U.S. Fish and Wildlife Service to take bus-loads of kids on sage grouse tours during the lekking season. FFA leaders in the classroom. April Hulet of the University of Idaho uses the Commission’s materials in her classrooms. The Rangeland Commission has played a key supporting role in the establishment of the Rangeland Center at the University of Idaho to expand much-needed scientific research on rangeland issues. The Commission recently shined the spotlight on the recent purchase of Rock Creek Ranch in Blaine County via a Life on the Range documentary. Rock Creek Ranch is the product of an excellent partnership between the Nature Conservancy, the Wood River Land Trust and the University of Idaho. Cutting-edge rangeland research is being conducted at the ranch and public education outreach via “Sagebrush Saturdays” is shared with policy makers and the general public. In another field-based education initiative through a partnership with the Forest Service, the BLM and the Idaho Department of Lands, the Commission created Care/Share educational signs at more than 100 recreation trailheads across Idaho to give hikers, bikers, ATV riders and horseback riders tips on how to co-exist with livestock on public lands. The key message on Care/Share signs is that if all user groups show respect for each other and care for the land, we can share public lands together for generations to come. “We saw a real need to speak to the recreationists directly, and minimize the conflicts between the livestock and recreational users,” Hyde says. Care/Share signs give recreationists tips about what to do if they encounter livestock on the trail. 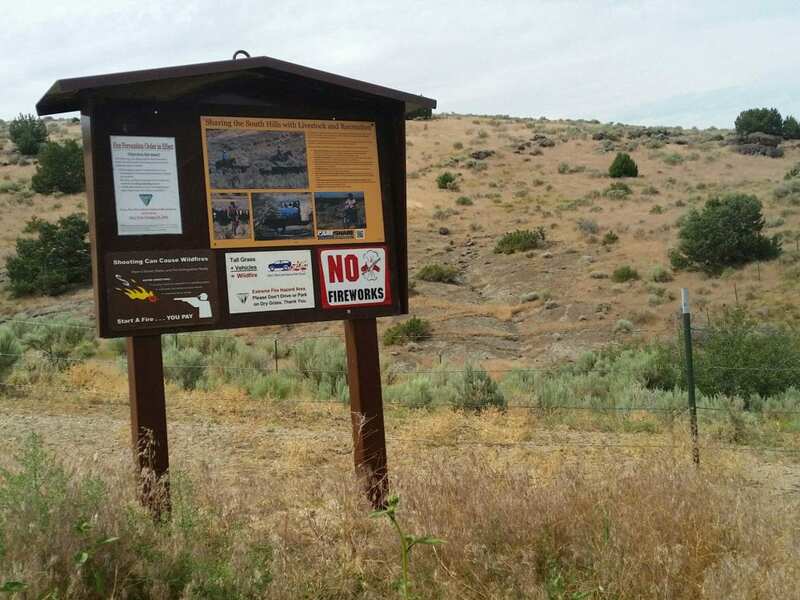 This one is located at a trailhead in the South Hills, near Twin Falls. The Commission found that by giving recreational users a head’s up that they may encounter sheep or cattle on the trail really helped. Plus tips on how to interact around livestock. “That’s been a real success. It gives us good visibility, but in addition to that, it provides some really valuable resources to the commission,” Brackett says. Follow-up polling 20 years after the Rangeland Commission’s initial poll has found that the Commission’s has strengthened public support for responsible livestock grazing on public lands and rangeland health. The latest poll that public support for livestock grazing on public lands was in the 90 percent range, similar to support for hiking, biking, fishing and camping. “In the studies we’ve conducted, there’s actually quite a bit of general approval and support for a variety of uses on public lands,” notes J.D. Wulfhorst, a professor of ag economics at the University of Idaho. “It has increased support for public lands grazing, and that’s been huge,” Brackett says. IRRC board meetings provide a great opportunity for a wide range of stakeholders to talk about potential partnership projects to improve land management. 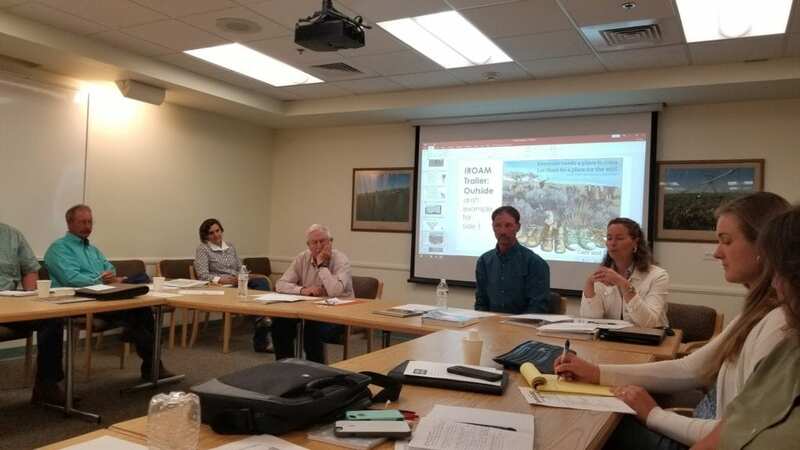 At quarterly board meetings, the Commission brings all of the natural resources agencies together to share information about initiatives and projects that often leads to new opportunities for collaboration and outreach. “I think the relationships and partnerships that evolved through the Commission is one of greatest success stories,” Hyde says. Over time, the directors of state and federal natural resources agencies have seen the value of coming to those meetings. Often, people discover new ways of working together on projects to solve conflicts and issues. “When you have the state Director of the BLM show up, and he sees an opportunity for him to partner on a project, it really has created some new opportunities that I don’t think would happen any other way,” Hyde says. 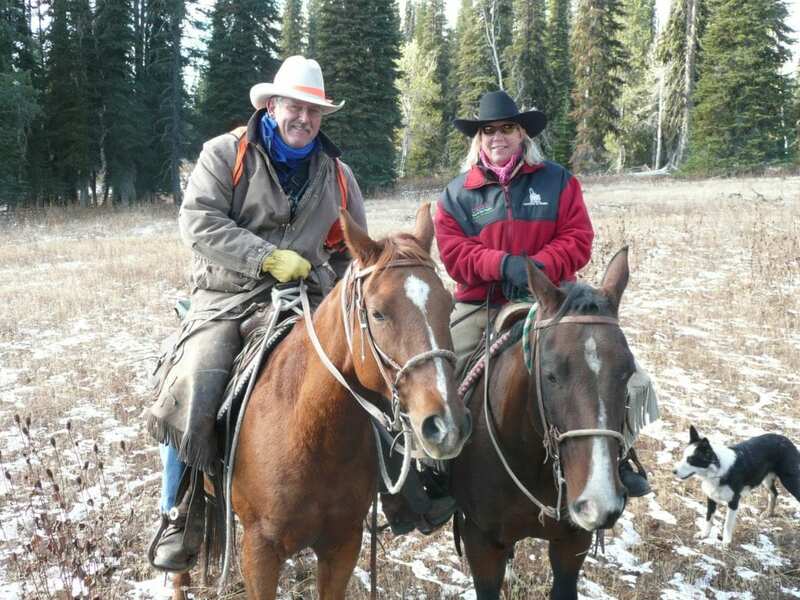 Royce Schwenkfelder, left, with his wife Pam, taking a break from herding cattle. Royce is the current chairman of the IRRC Board of Directors. Ultimately, the Commission has made great strides in reaching out to our urban neighbors in Idaho to provide extensive information and education about the value of rangelands. 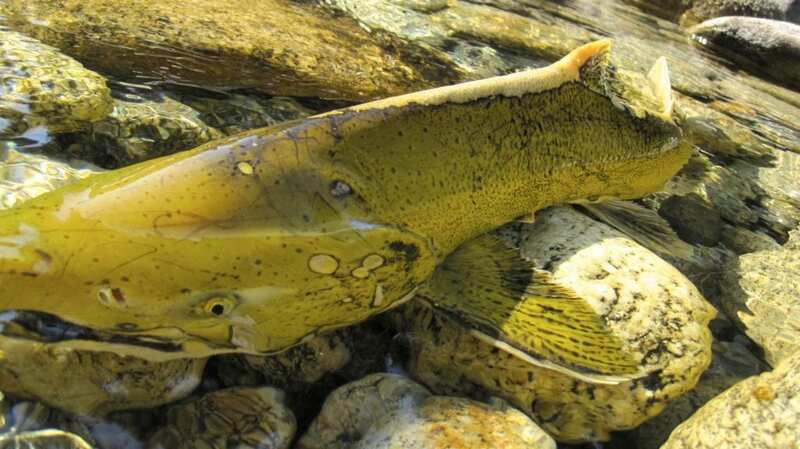 Outreach efforts have shown an amazing level of innovation, creativity and stewardship that occurs on Idaho private and public lands through smart, forward-thinking management, and partnerships with a multitude of supportive public agencies and NGO’s. “I’m proud of what they’ve done. I think it’s been a very positive impact to the state of Idaho,” Rimbey says. Steve Stuebner is the writer and producer of LifeontheRange.org, an education project sponsored by the Idaho Rangeland Resource Commission.